Location New York City; Arlington County, Virginia; and near Shanksville, Pennsylvania. 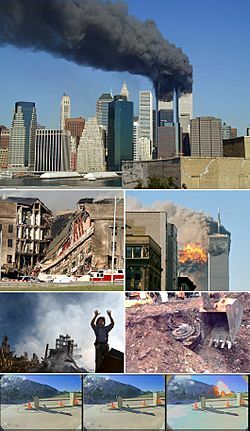 The September 11, 2001 attacks (or September 11th, or 9/11), were four terrorist attacks. They all happened at the same time. They were done by the Islamic terrorist group al-Qaeda. They attacked the United States in New York City. 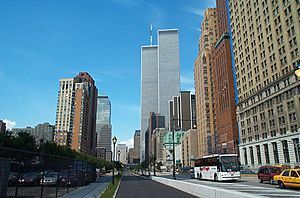 The attacks took place on Tuesday, September 11, 2001. 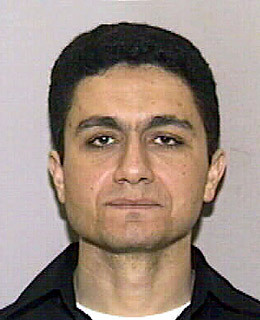 Four groups of terrorists, each with a trained pilot, captured airplanes and flew them into US landmarks. These landmarks were the World Trade Center's twin towers in New York City, and the Pentagon. The fourth plane crashed in an empty field in Pennsylvania before it could reach its target in Washington, D.C. After the event, the US government said the people who had done the attacks were close to the terrorist group al-Qaeda. During the events, almost 3000 people died. Most of them were from the United States, but over 300 were from other places, such as the United Kingdom, India, and Canada. View of the World Trade Center and the Statue of Liberty at the moment of 9/11 attack. The first of the four planes to depart was American ­Airlines Flight 11, a Boeing 767-200ER. It was 159 feet and two inches long, with a sixteen-foot-six-inch-wide body that allowed for two aisles. The plane made daily flights between Boston and Los Angeles, and when it took off at 7:59 a.m. on the morning of the eleventh, it carried only 81 passengers in its 158 seats. 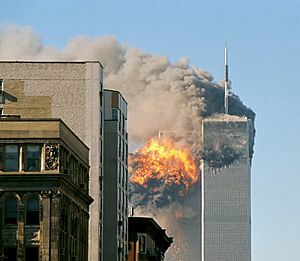 Forty-seven minutes later, it crashed into the North Tower at 440 mph, carrying 9,717 gallons of jet fuel, 14,000 gallons under capacity. United Flight 175, also a Boeing 767-200ER, was the second. Like American Airlines 11, it was scheduled to fly between Boston and Los Angeles. When United 175 took off at 8:14 a.m., it was even lighter than the American flight: Only 56 of 168 seats were occupied. When it crashed into the South Tower at 9:03 a.m., traveling 540 mph, it had 9,118 gallons of fuel in its tanks. American Airlines Flight 77 was the third plane to take off, a Boeing 757-200. AA77 left Washington, D.C., at 8:20 a.m. bound for Los Angeles. It was two-thirds empty, with 58 passengers in its 176 seats, and its tanks were 4,000 gallons under its 11,500-gallon capacity. It crashed into the Pentagon at 9:37 a.m., ­flying 530 mph. The fourth plane, United Airlines Flight 93, was also a 757-200. It was delayed for 42 minutes past its ­scheduled 8 a.m. departure from Newark, New Jersey bound for San Francisco. When it finally took off, it carried only 37 ­passengers—its capacity was 182—and it was loaded with a little over 7,000 gallons of fuel. It crashed at 560 mph into an empty field in Shanksville, Pennsylvania, at 10:03 a.m. Ground zero: The remains of the World Trade Center after the attacks. All of the 246 people on the four planes died in the crashes. 19 terrorists were also killed in the attacks. Both towers of the World Trade Center caught on fire after the crashes. 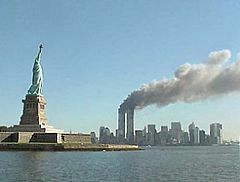 The South Tower (2 WTC) burned for 56 minutes before it fell and was destroyed. 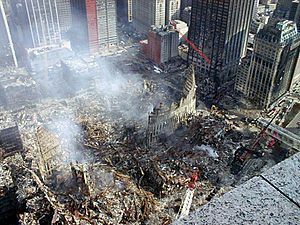 The North Tower (1 WTC) burned for 102 minutes before it also fell. As the towers fell, parts of the towers hit other buildings around them. It is believed that because of this damage, a third building, 7 World Trade Center (7 WTC), fell at 5:20 p.m., but this is a debated subject. Many other buildings in the area were damaged badly and had to be demolished later. 2,602 people died at the World Trade Center. 2,996 people died in the attacks, including people such as firemen and policemen trying to save the lives of other people. 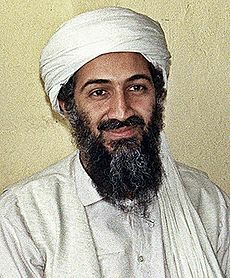 Many conspiracy theories have appeared which say that certain people in the United States government knew about the attacks beforehand, or even made them happen. The World Trade Center before 9/11. September 11 attacks Facts for Kids. Kiddle Encyclopedia.